Leave the 27mm f2.8 on your Fuji X series body to have the ultimate, high-quality, lightweight travel combo. With a design that could easily have it labelled as the ultimate travel lens the ultimate travel lens the Fuji 27mm weighs under 80 grams, a certified lightweight! 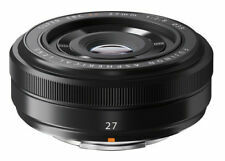 New Fujifilm XF 27mm F2.8 - Black. Condition is Brand New. Sent with Australia Post Pre-Paid Parcel Post Satchel 3kg. Trending at AU $509.93eBay determines this price through a machine-learned model of the product's sale prices within the last 90 days. Trending at AU $266.41eBay determines this price through a machine-learned model of the product's sale prices within the last 90 days. Fujinon's HT-EBC lens coating reduces reflections at a wider wavelength and minimizes flares and ghosting. A built-in high-torque DC coreless motor provides fast and accurate autofocus. It provides a 55.5° angle of view. Mount type Fujifilm X-mount. This coating works to protect the front lens surface as well as reduce lens flare and ghosting in order to provide more contrast-rich imagery. Dead on Arrival (DOA) or Faulty Item Cases. Weather-Sealed Design, Fluorine Coating. The long focal length coupled with the f/2.8 maximum aperture is well-suited to isolating subject matter, especially when paired with the short 9.8" minimum focusing distance and 1:1 life-size magnification for macro shooting. 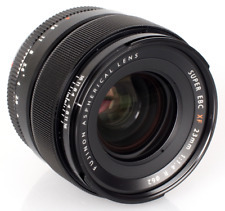 1 x Fujifilm XF 56mm f/1.2 R APD Lens. Focal Length 56mm. Autofocus Yes. 1 x Lens Hood. Cell phone & Accessories. HT-EBC Multi-Layer Lens Coating. Any other cause, which does not relate to a product defect. Colour Black. Dead on Arrival (DOA) or Faulty Item Cases. For Australia Orders Auto focus Yes. Zhongyi Mitakon Speedmaster 35mm f/0.95 Mark 2 for Fujifilm XF X-Pro2 X-T1 X-E2 (Silver) Zhongyi Optics (ZY Optics) has released an improved version of their first f/0.95 lens, Zhongyi Mitakon Speedmaster 35mm f/0.95 Mark II. The mark II verison features a drastic improvement of sharpness, better control of chromatic abberations and much compact size. The new version comes with a Fuji X / Sony E / EOS-M mount and is able to cover the image circle of APS-C sized sensors. .
Fujifilm Single-Focus Wide-Angle Lens Xf23Mmf1.4R. Our Products are 100% Authentic. The best of two worlds. A FULL ZEISS WARRANTY IS SUPPLIED AS NEW. • Gives effective focal length of 50mm on a Fujifilm X Body. • Minimum focusing distance of just 37cm. • Focusing range: 0,30 m (0.98 ft) – 8. Lens type: fixed lenses. Type: standard lens. Lens mount: Fuji Film X. Fixed focal length: 50 mm. Focal length (wide end): 390. Color: black. Image stabilization: Yes. Sui table for fujifilm X-A1/A2 X-E1/E2/E2S X-M1 X-T1/T10 X-Pro1/Pro2. The 35mm focal length is also known as "humanistic focal length". Focal length: 35mm (fixed). Lens type: pure manual. 1 lens cloth. Fujifilm XF 90mm f/2 R LM WR Lens. Focal Length 90mm. Other Animation. all products are original 100% authentic and never been used unless otherwise stated. 2.95 x 4.13" / 75 x 105 mm. But it may delay due to Custom / Weather. (Wide-angle) focal length: 90 mm. Lens type: fixed lenses. Type: standard lens. Lens mount: Fuji Film X. Product weight: 540 g. Model year: 2015. Product number: P10NL00210A. The large aperture of F1.2 can ensure more light input and faster shutter speed. Sui table for fujifilm X-A1/A2 X-E1/E2/E2S X-M1 X-T1/T10 X-Pro1/Pro2. Humanistic focusing section, the works shot closer to the effect of seeing things. The lens is suitable for a vast amount of applications, including landscapes, portraits, travel and night photography. View Our Categories. The fast maximum f/1.4 aperture allows you to capture beautifully crisp stills and movies handheld, even in low light conditions. 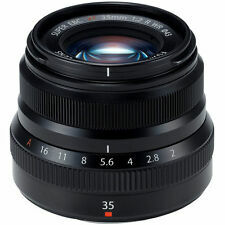 Kaxinda 35mm f/1.7 Lens for MFT M43 Fujifilm FX X-A1 X-M1 X-E1 X-E2 X-Pro1 X-T1 .